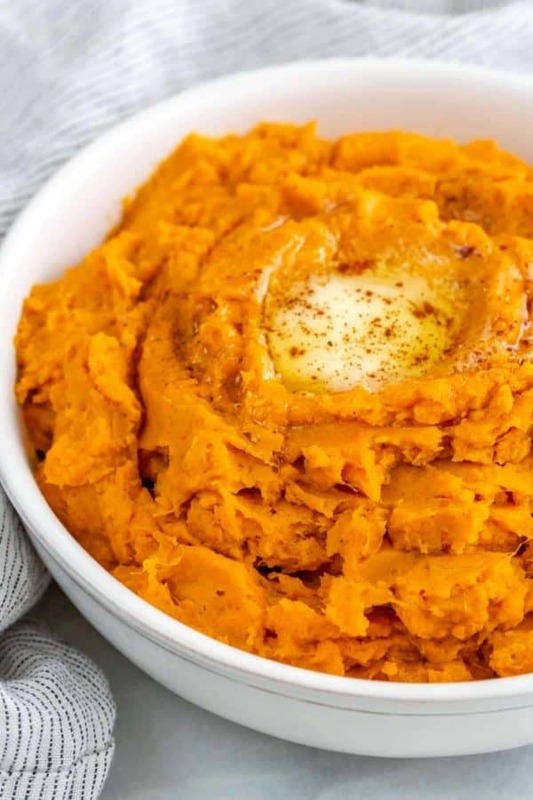 Instant pot mashed sweet potatoes are a colorful and tasty alternative to the classic pale side dish. The electric pressure cooker transforms the dense tubers into soft and tender pieces that are easy to mash. For this recipe, I keep it simple and fold in warm spices like cinnamon, nutmeg, a pinch of salt, and a hint of butter to enhance the natural caramel flavors of the potato. The pressure built up in the Instant Pot elevates the cooking temperatures while using hot steam to soften the cells of the potato within minutes. The result is tender taters that can be made into a creamy puree. Sweet potatoes already have a plentiful amount of natural sugar, so I just add warm holiday spices like cinnamon and nutmeg to balance the taste. It’s like dessert in a bowl, but without the guilt! All that’s needed for this pressure cooking technique is a few pounds of chopped sweet potatoes and water. Additional mix-ins are up to you as this recipe makes for a versatile base to create a sweeter or more savory flavor. With the vast variety of potatoes, I recommend Garnet sweet potatoes. They have a bright orange flesh that cooks up to be very sweet and moist. Other varieties like purple, Jewell, Japanese, Okinawa, and Hannah can be used, however, they may have slightly different texture. For quick and even cooking of the sweet potatoes, cut them into 1-inch pieces. Anything smaller and they’ll crumble apart too easily. Make sure to insert the steamer basket on the bottom of the pot, then put the cut potatoes on top. Elevating the ingredient will allow the steam to evenly cook the potatoes. All you need is 1 cup of water for 2 pounds of sweet potatoes to fully get the pot up to pressure and properly cooked. It’s important to mash the potatoes with the butter. The fat helps to coat some of the starch particles so that the texture stays creamy but not gluey. If you want an even smoother texture, puree in a food processor for a few seconds. I use this technique for my sweet potato casserole recipe. While dispersing the seasonings more evenly as you mash, add the spices and salt right in with the butter to save you an extra step. For a lighter product, fold in some cream, milk, non-dairy milk, or coconut milk until an airy consistency is reached. A drizzle of pure maple syrup or honey would also be tasty for those who have a sweet tooth like me. This mashed sweet potato recipe can be made ahead of time and reheated right before serving on the stove top or in the microwave. Using an electric pressure cooker is an efficient alternative to other methods. If you don’t have time to make baked sweet potatoes, this Instant Pot method is a great option. Using the high-pressure setting, tender sweet potatoes that can be easily flaked with a fork cooks relatively quickly. The high pressure of around 13 psi plus the steam heat can cook a whole unpeeled sweet potato in 15 to 16 minutes. For cut and cubed pieces, 10 minutes is plenty of time. 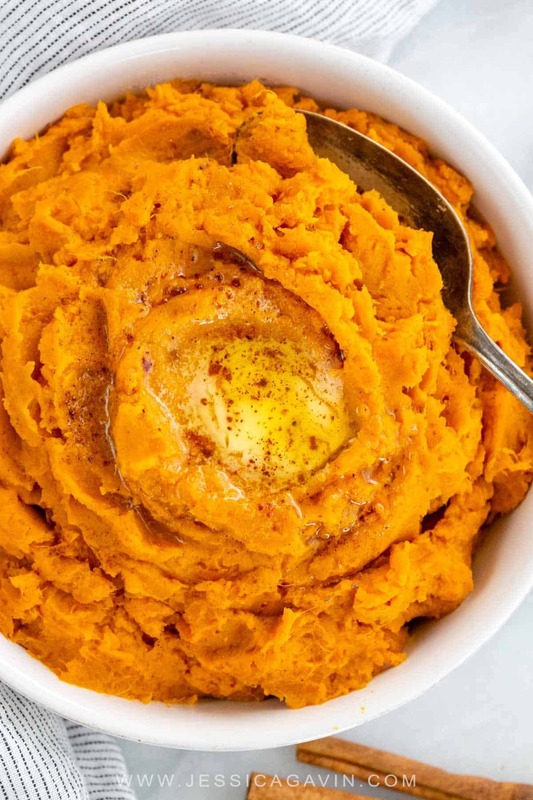 Instant pot mashed sweet potatoes made with warm cinnamon spice and nutmeg are a colorful and tasty alternative to the classic side dish. Add cut sweet potatoes and water into the instant pot. Make sure that the release valve is in the "Sealing" position. Place the lid on the Instant Pot, turn and lock. Press "Manual" button on the Instant Pot on high pressure, and then set the timer to 10 minutes using the "+" or "-" buttons. It will take about 10 to 15 minutes for the pot to heat and build up the pressure. You will see some steam release from the lid, and then the time will start on the display. Once cook time is complete, carefully quick release the pressure from the pot by turning the steam release handle on the lid to "Venting" position and then remove the lid. Drain the potatoes and transfer them to a large bowl. Add butter, cinnamon, salt, and nutmeg to the potatoes. Mash the potatoes using a potato masher until a smooth puree is created with some small chunks. Adjust seasonings as desired. MAKE IT WHOLE30: Use Ghee instead of butter. Use sea salt instead of kosher salt. MAKE IT DAIRY FREE OR VEGAN: Use coconut oil or olive oil instead of butter. Thank you for you’re feedback, Jennifer! How big did you cut the potatoes? Please let me know if 8 minutes works better for you.